You’ve probably heard about rising fears about inflations in the US and pretty much all the countries in the world. Current inflation in USA is about 4%. This Southern African country currently boasts inflation over 100,000%. What does this mean? With inflation at 4% it takes 18 years for money to lose half of its value. By using the rule of 72 we can calculate that with inflation at 100,000% it takes about 6 hours and 20 minutes for your 100 dollars to become $50. With inflation this high it means that when you leave your shopping for the next day you have effectively lost 93,75% of your money. In 1922 and 1923 Germany went through it’s worse inflation. 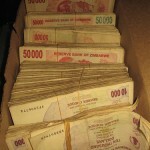 According to Wikipedia in 1922, its highest denomination was 50,000 Mark. By 1923, the highest denomination was 100,000,000,000,000 Mark. In December of 1923 the exchange rate from marks to US dollars was 4,000,000,000,000:1. During the worst times, one U.S. dollar was equal to 80 billion Mark. In a financial jam? Instant Loans from MyPaydayLoanCash.com can solve your problem today. Do you know what kinda of prices Zimbabwe has right now? 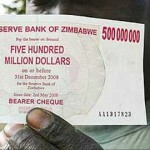 And is that 60 million Zimbabwe dollars even worth much with their inflation state? Now I can say Good Morning Roman Thats a little frustrating, all these people in America working so hard to become a millionaire. When all they have to do is move to Zimbabwe. Post request Roman. Can you define “recession”? If I do it, it will seem like a political post. I’m with Switzerland on that one. 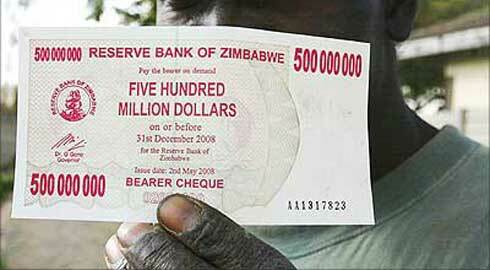 Why is Zimbabwe suffering from hyper inflation? Zimbabwe is not a South African country, South Africa is a country on it’s own. Zimbabwe is, however, a ‘Southern African’ country. Nope, as a South African referring to Zimbabwe as South African is defintely a no-no, especially with their economic meltdown and the consequential impact on South Africa – Southern African country is correct. BTW, the inflation is officially 165 000% but according to independant sources it is now over 1000000 % (1 Million). Thanks for keeping me updated Pieter! Maybe I should add one 0 to my post headline! On the 10th or January 2009, their inflation was 231,000,000% (231 Million). 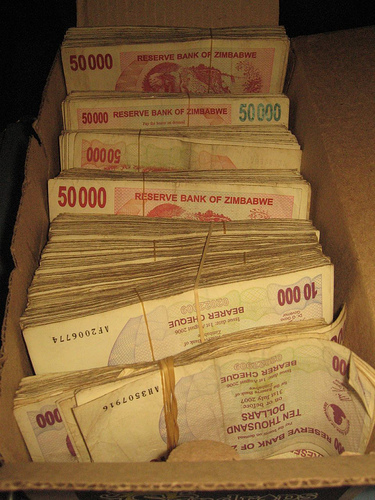 And the exchange rate was 1 USD – 25,000,000,000 Zimbabwe dollars. Thanks for the update Drake! Now that the Zimbabwean regime has allowed the use of foreign currencies in domest transactions, there’s hope for economy recovery (willingness to work). It’s somehow confusing,I think the south Africans should change the name of their country to some thing else maybe “wack” Africa so there woun’t be mis-understanding in this South or Southern Africa stuff. Thanks Roman, For sharing the interesting financial news, i like you all posts, Every post have some unique fact and interesting thing.